Hello, my name is Jason Johns. 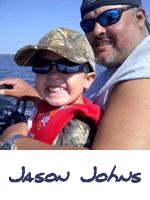 I have been a professional fishing and hunting guide for over 15 years exclusively in Southern Illinois. I fish all lakes in Southern Illinois including Rend Lake and Lake of Egypt, and have guided clients from all parts of the United States. I own and operate Boneyard Fishing and run the Boneyard Lodge offering quality overnight acommodations for our hunters, making us the only full service fishing and hunting guide service in Southern Illinois. I spend all my time on the water or in the woods to ensure that every trip you have to Southern Illinois is memorable. To further accommodate my clients, I am constructing a custom fish cleaning station that will be one-of-a-kind to the entire Rend Lake region. I work with fundraising for worthy causes and constantly try to inspire young people to embrace the art of fishing and hunting. I also work with both the Democratic and Republican politicians in the area on celebrity guide trips and fundraising events. From time to time I film TV shows and write articles with Don Dziedzina (Chicago Tribune Outdoor writer, Owner/producer of Illinois Outdoor TV, and host and producer of Fishing and Outdoor Radio Show), Jeff Lampe (Owner of Heartland Outdoors Magazine), and Dale Bowman (outdoor editor of Chicago SunTimes). Dave Watson, TV Celebrity and host of Matthews TV, filmed a deer hunting show at the Boneyard in December of 2011 and came back again in the Fall of 2012 to film another show which will be airing soon. I have also guided and worked with other legendary outdoor writers like Bobby Whitehead, Curt Hicken, and Don Gasaway. Dan Stefanich, another well-known Midwestern outdoor writer and photographer, is an avid outdoorsman and frequently hunts and fishes with us here at the Boneyard. Meet the rest of our incredible Guide Staff — some of the best outdoorsmen in Southern Illinois. We hope to see you in camp soon! 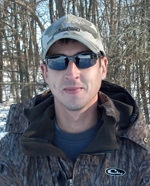 Scott Sevenski is one of the newest additions to the Boneyard Guide staff. 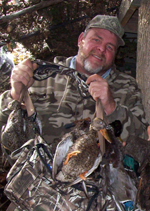 With over 21 years of local hunting and fishing experience, Scott knows his way around the Rend Lake region. He has an easy-going personality and always works his tail off for our clients. He wants to make sure every Boneyard client has an awesome experience, so he takes into the consideration of the client’s needs, to make sure the hunting situation meets their physical capabilities. He's an exceptional woodsman and is constantly moving our deer stands based on changing deer patterns. When you drop that big buck, rest assured Scott will be there to get him back to camp and on the meat pole! Chad Holman has killed more wild turkeys than the founding pilgrims. His calling skills are unmatched and each season he has big longbeards strutting into the laps of our hunters. Chad is also a Champion breeder of Brittany Spaniels and has won numerous field trial championships. They have won 12 National Field Championships with three generations of dogs. You can say the outdoors is in his blood. Chad is the owner of Holman Kennels www.holmankennels.com. With seven seasons under his belt at the Boneyard, Dan knows the local haunts and honeyholes of the big bucks and warey gobblers. He’s a regular Boneyard hunter, but also works with the Boneyard staff and hunters to locate the game and put hunters in prime spots. And once you bring back your trophy, Dan will turn it from trophy to tablefare in about 20 minutes using only his filet knife. Read more about Dan at www.DanStefOutdoors.com.